Garageband app has become very popular among people worldwide because it has been in the market for a while now. For those who have no idea about it, Garageband is a audio workstation that lets you create podcasts and produce music or soundtracks. It is only available on MacOS and iOS and it is developed by Apple Inc. It is a part of iLife software suite. It lets you create multiple soundtracks with pre-made loops, pre-made MIDI keyboards, voice recordings and carious instrumental effects, all of which is possible due to the music and podcast creation system. 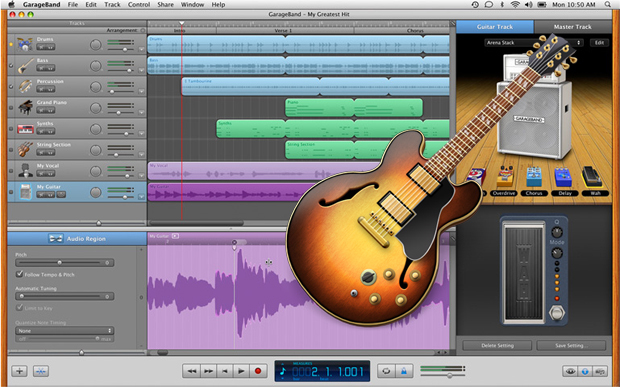 Garageband is arguably considered to one of the best software for the purposes of music production. Although it has an GarageBand PC version and Android version as well, but it is very slow and it causes the computers to lag and function slow which doesn’t let it work as good as it works on Mac. So, you need not worry about it because there are many more apps that work like Garageband. So if you do not own a Mac OS or an iOS device, you need not be sad because there are many other apps which are compatible with android or windows OS. In this article, we will list down some of the best alternatives of Garageband software which would be perfect for you to produce music and podcasts without having the need to buy a Mac or an iOS device. Mixcraft Home studio- The most basic version, it is most suitable for users who do not need a lot of high-class features. It is the first priority of newcomers who have just started. Mixcraft Recording studio- A slightly better and upgraded version of the Home Studio, this is for users who need more features than the ones what come with Home studio. Mixcraft pro studio- As per the name, this is the top version of the app and is best option for advanced users who are deeply into music production. Professionals are the ones that mostly opt for this version. Some of the most incredible features an app can have are available in this digital audio workstation which make its performance top-class and makes it a choice for many music creators out there. The apps mentioned above are few of the best alternatives for Garageband that are available in the market. You don’t need to own a MAC or iOS device to run these apps as they are compatible with windows as well. You can choose any of these apps according to their performance on your device. We can guarantee you that these apps are the best alternatives and none of the apps would disappoint you at all because of their performance or anything. However, most of these apps are paid, so you will have to buy their membership. But you can check first by using the trial pack.